Taken at the Jeter Farm Pumpkin Patch and linked with Barn Charm. Love your barn charm pics! This one is especially cute though! This time of year I really miss having little ones around, such a cute picture!! What a wonderful picture! I love the vivid red of the barn and the boys looking ready to leap! Now that is a shot to treasure! LOVE it! Oh Lisa! This is the best picture ever!!!!!! This is a special one! This picture is so great! I love the barn and the colors. This is a framer for sure! I used to fly into Roanoke when I was a flight attendant years ago. I always loved to go to the Farmer's Market there. No flying dogs though! They are absolutely ready to conquer those evil farm animals! Lisa-I love this photo!! It's not only a cute photo of your boys, but it's a really excellent photo too! What a wonderful photo--the boys look intent on taking the barn! Awesome capture. Just look at the boys out on an adventure! Probably hard to get a picture of them standing still at a fun place like that. So cute. Your little action hero farmers. Love it! What a great picture! I miss barns, we just don't have many in Arizona. Your boys in their super hero costumes are adorable! I like the big red barn a lot, too! That is the visual for "Skulk!" AH----what a perfect 'Barn Charm' photo... Cute picture of the twins!!!! What a great photo! 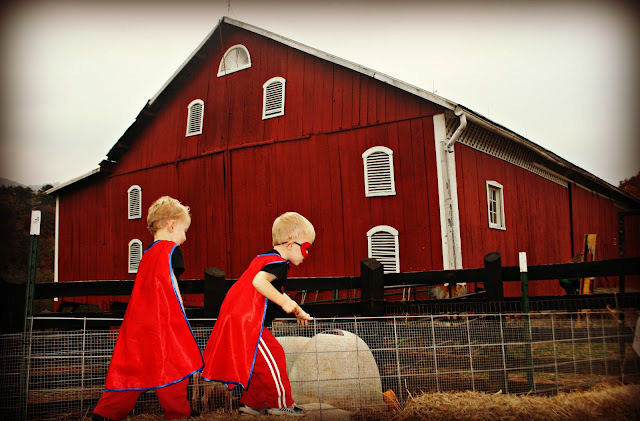 I love all the red in this photo from the Super Twins and that awesome red barn! Those are some cute superheroes!! Love it....it's a great photo!! great barn, awesome that you included those handsome boys!! There is so much I love about this photo! The red barn is so vivid, and I love the twins skulking. Those cutie patootie twins of yours are going to be such a blessing in your life always. They are TOO cute!!! Oh ...and I did notice the cool barn, too. great photo, love it! i recognized this barn right away from the thumbnail! not too far from my house! The barn is a beauty, but oh, those kids just add so much to the shot. Nice barn and looky there! It comes with an adorable set of super heroes! Looks like a well cared for barn. Great capture with the boys! Love your heroes, and love your barn! Great photo, Lisa!!! Love that red barn. So cute! The barn is fantastic! awww, your little ones are too cute. love your capes.